Vision 2030 Delivery Secretariat Director General Mugo Kibati addressing the 2013 Samsung Engineering Academy class. NAIROBI, Kenya, Jan 18 – Kenya’s efforts to develop a pool of technicians trained in modern digital solutions has received a major boost from Samsung Electronics East Africa (SEEA) which is set to graduate a class of 200 technicians in coming weeks. The technicians trained to repair and service modern electronic devices and equipment at the Samsung Engineering Academy are expected to significantly raise Samsung’s local after-sales service support capacity. As part of the global Samsung Hope for Children Outreach programme, the one-year training course is delivered at zero cost to the students drawn from six local technical schools. Developed at a cost of more than Sh84million as part of Samsung’s pilot project to roll out vocational engineering academies to train 10,000 electronics engineers in Africa, the Samsung Electronics Engineering Academy in Nairobi is targeting to contribute 2,000 graduates in the continental pilot programme by the year 2015. The 200 students set to graduate this year are from local technical training colleges such as the Multimedia University College, Kabete Technical Training Institute, PC Kinyanjui Technical Training Institute and the Nairobi Technical training Institute have been undergoing specialised training at the academy. 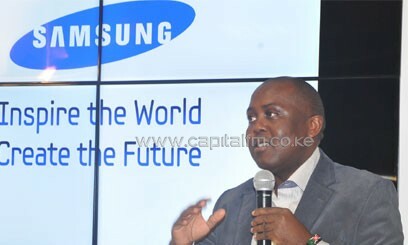 This year, the Samsung Engineering Academy has expanded its intake by including trainees from Machakos University College during the orientation session to welcome 120 new students to undertake the one-year course, officiated by Vision 2030 Delivery Secretariat Director General Mugo Kibati. “Given our current growth rate in Kenya and across the region, Samsung is deliberately developing a pool of skilled technicians and exclusive service experts to handle growing demand,” Samsung Electronics East Africa Service Business Leader, Koki Muia explained. Trainees graduating from the Samsung Electronics Engineering Academy will be comprehensively trained to repair and service a broad range of digital consumer electronic appliances such as LCD TV’s, Smart phones, refrigerators, air conditioners and laptops among other appliances. During the session, Kibati challenged Samsung Electronics East Africa to consider doubling its target of 4,000 trainees due to the high demand for such skills. The government, Kibati said, had already moved to create a conducive environment for the development of such facilities with recent passing of the Technical and Vocational Education Training Bill (TIVET) 2012, which also received the presidential assent early this week. The TIVET Act, Kibati explained, provides for the establishment of a technical and vocational education and training system. The Act, he added, also provides for governance and management of institutions offering technical and vocational education and training by providing a mechanism to assess the quality of services offered here through examination and certification. “With this presidential seal, the TIVET bill is now an act and one of the Vision 2030 tools that will guide our national Economic Development,” Kibati explained. As an added incentive, outstanding trainees at the Samsung Electronics Engineering Academy, also stand a chance to participate in a yearlong internship opportunity at the Samsung Head office in South Korea as part of the 100 African young leaders program. Alongside Kenya, such Samsung Academy programmes are currently being piloted in South Africa, Ethiopia and Nigeria with plans to up scale the initiative to more African countries by 2015. Notwithstanding the worldwide economic uncertainty, Samsung has affirmed that it wants to expand future growth engines while contributing to national economies.